The new P870DM now with dual GTX 1070 or dual GTX 1080. Any possibility to see some pictures of the interior of it like you did for the other models please ? Also, would it be possible to just put a single 1080 in it to make room for a better cooling solution maybe ? Following my previous message and to illustrate my point, i just found this picture of the previous P870DM on notebookreviews. As you can see this one uses both fans & heatsinks to cool one gpu, which would be very useful for a single 1080. Is this similar with the P870DM2 ? Any availability for this model ? Nop that is not a good design and it was actually problematic in previous generations, where one of the cards would have temperatures a lot higher. Both cards have same temperatures. Hello, and thanks for the quick answer ! However my picture was not one of a SLI System, it actually was a single 980 which was cooled by the 2 fans & the 2 heatsinks. As you can see in Clevo product page, the P870DM2 is not the same product as the P870DM3 which is the one you just linked. GPU is not cooled the same way in DM2 because it can actually uses the 2 vapor chambers to cool ONE single gpu. So my question is, is there a chance you'll have a P870DM2 available ? That would be great for the 1080. For now we are not sure if we will have a P870DM2, but later i will check it is a viable option for us. I need to think it through! 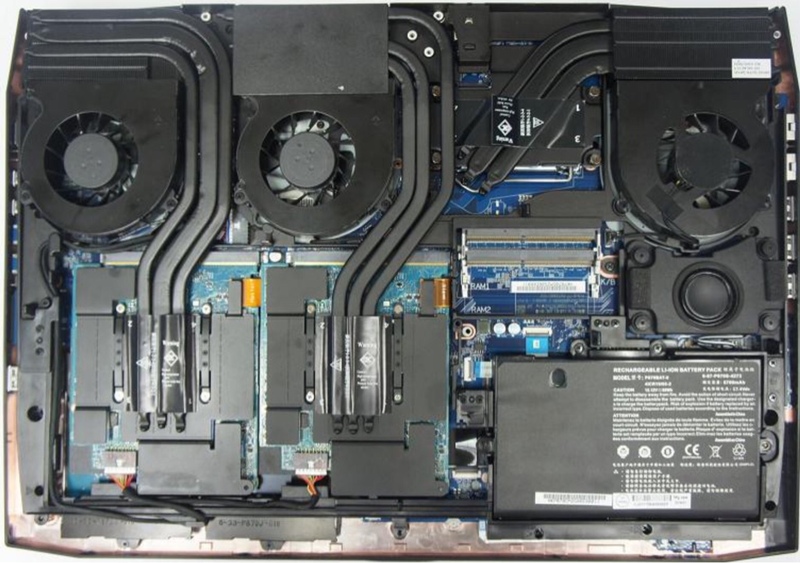 I'd like to start an official thread about barebone and custom laptops (which is still very unknown for a lot of people in europe) on a good old french forum and could use an enthusiast single-gpu model like this one to make some reviews and illustrate everything, so keep me posted if you have it someday ! would it be possible to make a custom order for me? I want this chassis configured with 6700k, 32gb 2800mhz RAM, 512gb m.2 NVME SSD but completely without the GPUs. Is it even possible to build this laptop without the GPUs and using the integrated Intel HD 530? How much would this setup cost? With the dual GPUs the cost is approximately 3500€ so how much lower? And how about with a different chassis like P751DM2-G. The same components (Intel i7 6700K, 32GB (2x 16GB) G.Skill Ripjaws, 512GB OCZ RD 400) yields about 2200€ with the OS. How much would the cost be without the GTX 1060? would it be possible to make a custom order for me? I want this chassis configured with 6700k, 32gb 2800mhz RAM, 512gb m.2 NVME SSD but completely without the GPUs. Is it even possible to build this laptop without the GPUs and using the integrated Intel HD 530? How much would this setup cost? Nop sorry, it will only work with a Dedicated GPU. Sorry to hijack the thread but how about replacing the 6700T on the N350DW with 6700k? They use the same pins, the only problem would be potential overheating am I right? But it seems that you only have Portuguese keyboards. Sorry to hijack the thread but how about replacing the 6700T on the N350DW with 6700k? They use the same pins, the only problem would be potential overheating am I right? The only problem is that you only seem to have Portuguese keyboards. The cooling system on that unit is not enough for that CPU, only low voltage ones. Power would also not be enough and BIOS would need support for that. Sorry it´s limited to low voltage ones! Thanks a lot! By the way, I tried to checkout for fun and your system asks for a VAT number which I don't have as an individual. I don't have a company. So I can't checkout currently. Am I doing something wrong? That is actually a strange issue, in Portugal our laws demand that all invoices must have a TAX number, it is called "Numero de Contribuinte or NIF" in Portuguese and we all have one, in spain its the NIF or CIF, and every European country should have something like this. But a lot of clients have reported that they do not have one in their country so we will add a text there saying "write 999999999" if you don´t have one. Is this possible and how much would the cost be? Nevermind, I found another chassis better for my needs. The all purpose of the P870 is the SLi technology.